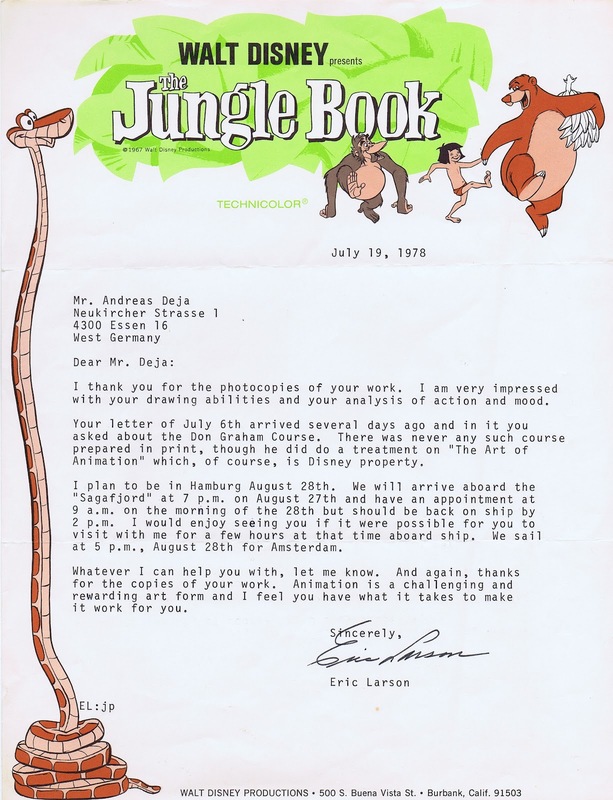 The previous post kept me thinking more about Eric Larson. 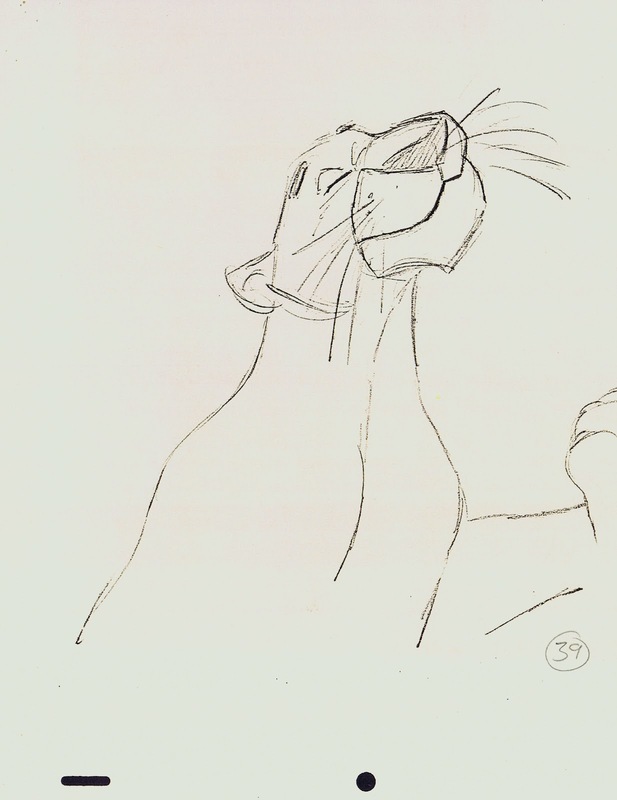 He was the first Disney artist I wrote to, and we even met in Hamburg, Germany, where Eric and his girlfriend Hazel had a stopover during a Northern European Cruise. 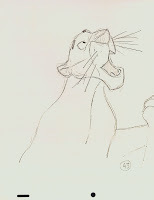 I understood maybe half of what he was telling me. It was pretty darn frustrating. Words of wisdom lost in translation! 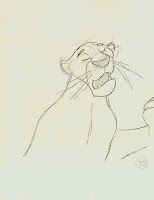 I remember Eric being somewhat shocked, when we (Hans Bacher was also there for the visit) told him that we travelled by car for over six hours to see him. He almost felt bad for having invited us, and said he had no idea that we lived that far. 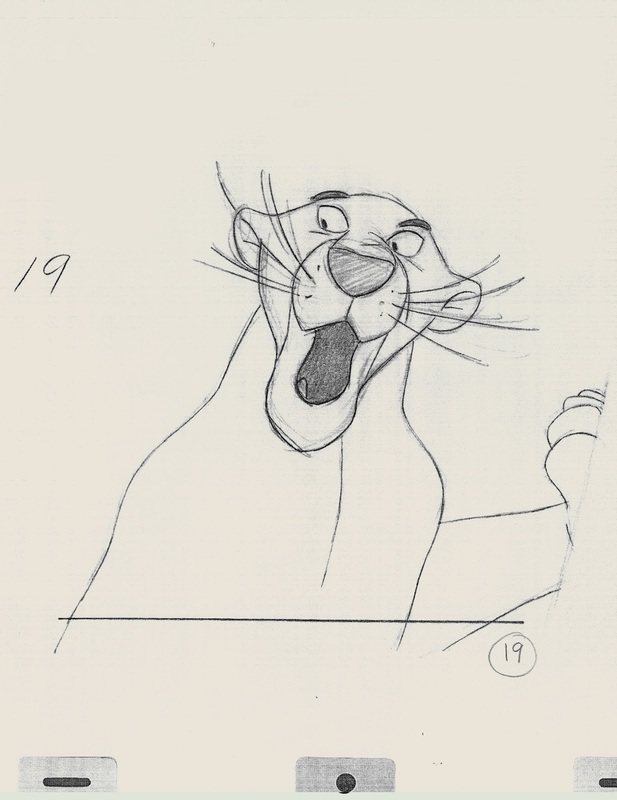 We just told him how thrilled we were to meet him. 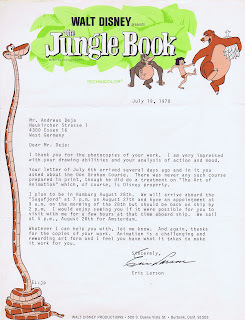 This is the letter Eric sent me ahead of his vacation. 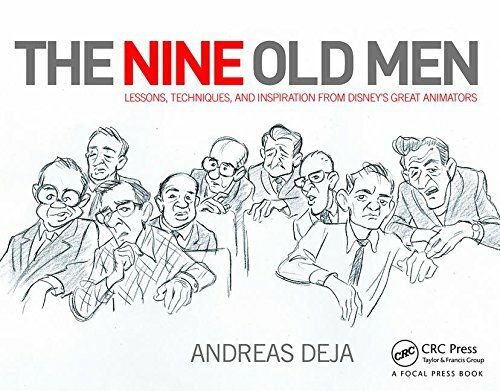 Imagine, not only an invitation to meet a wise old man from Disney, but then his words of encouragement at the end of the letter. 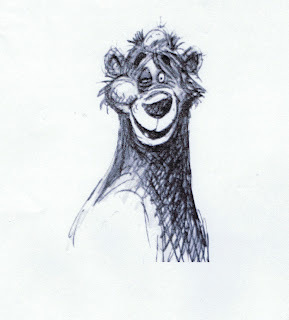 I remember, that was a very good day indeed!! 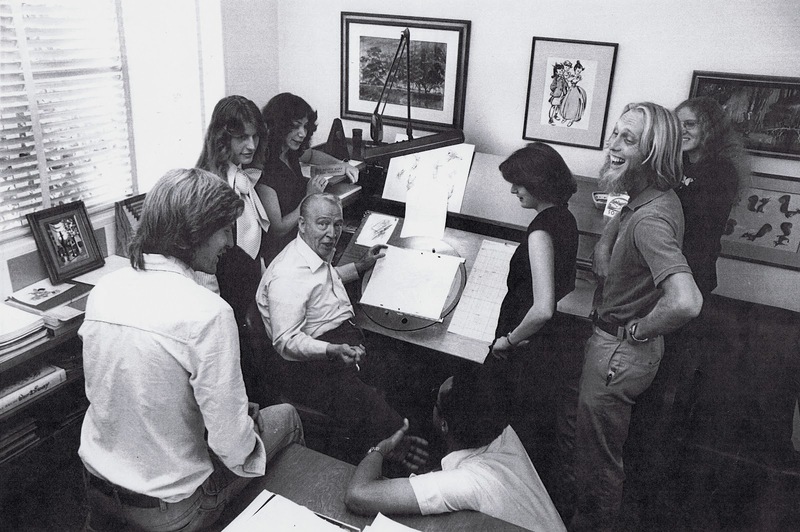 Here Eric is surrounded by animation trainees, who all started the program before I did. Behind Eric is Lorna Pomeroy, then Heidi Guedel, Bill Kroyer, Dan Haskett sitting on the floor, Emily Jiuliano, Henry Selick and unknown. 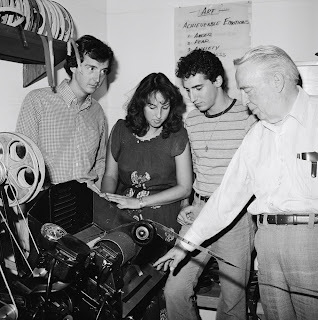 In this shot you see Eric with trainees, who started at Disney soon after I did. They are Bill Frake, Kathy Zielinski and Matt O'Callaghan. 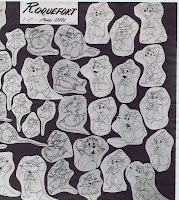 I loved these old Moviolas. 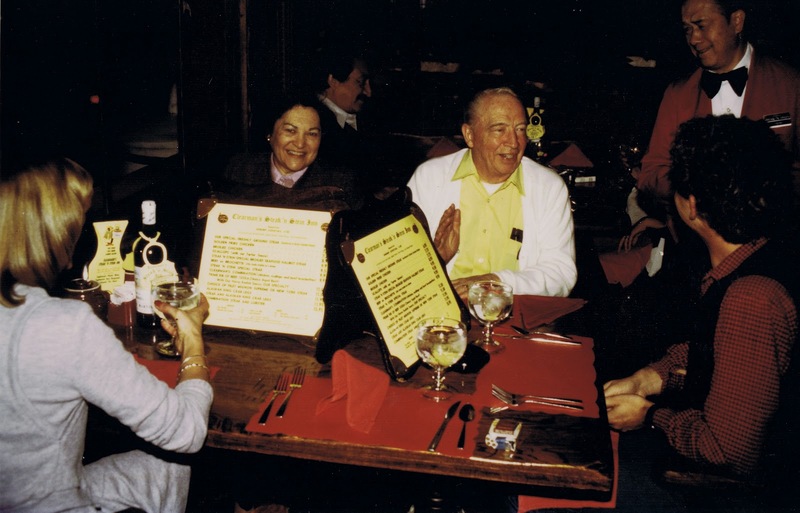 Hans Bacher took this photo during a dinner that included his late wife Hanne, me, and Eric with Hazel. We dined in a local restaurant in Pasadena during our first trip to LA. 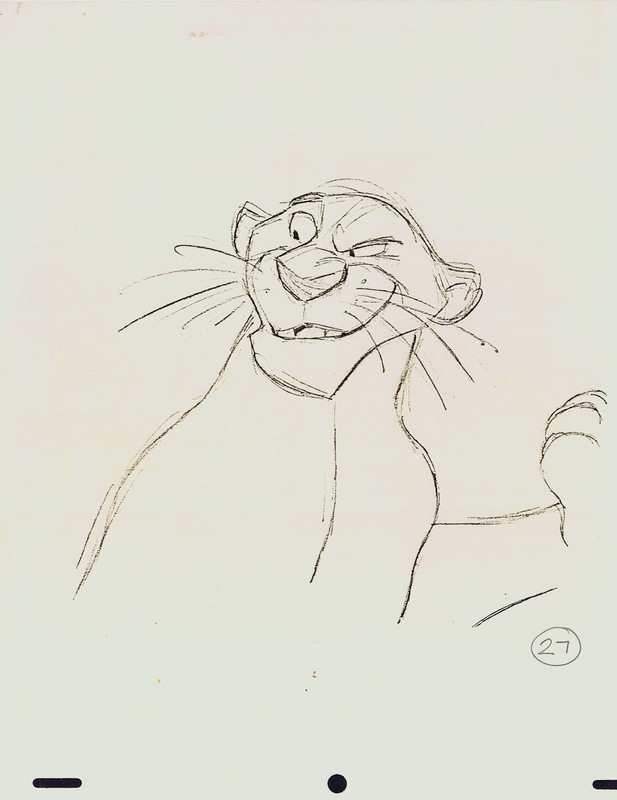 What is Eric saying that made the waiter cringe? One weekend, after I had started at Disney, a few of us surprised Eric at his home in Flintridge to wish him a Happy Birthday. 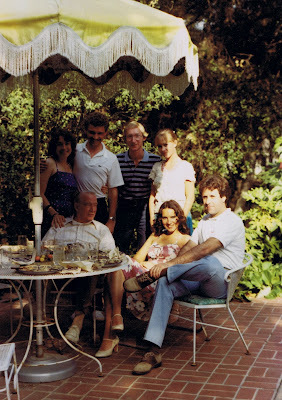 Behind Eric is Dolly Baker, me, Don Paul, Sue Frankenberger, Ted Kiersey and Carol Holman Grosvenor. 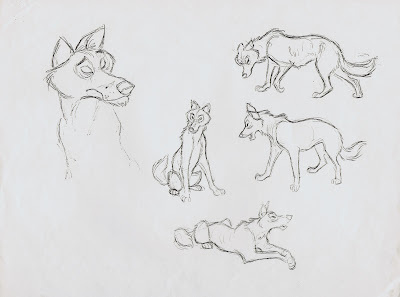 So what are the things I remember most when I think of Eric's teaching? 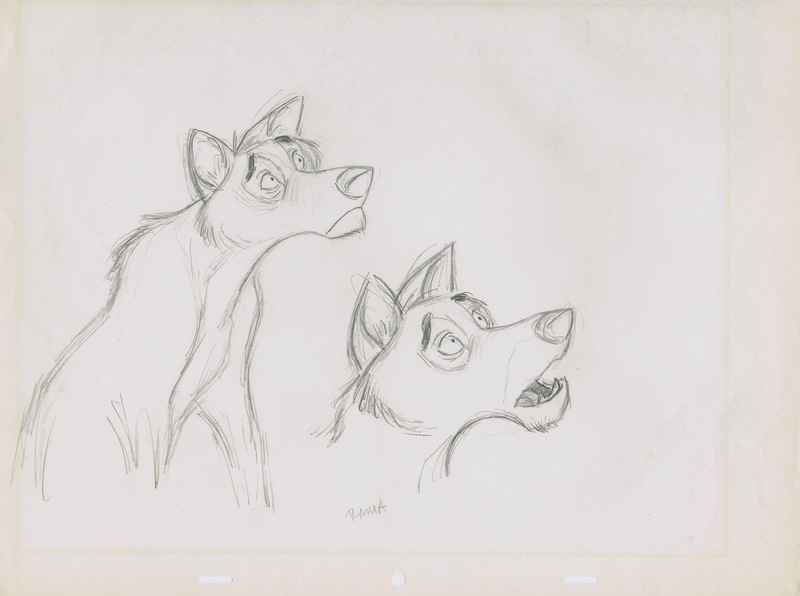 He always stressed observation because it allows you to put your own experiences into your work. 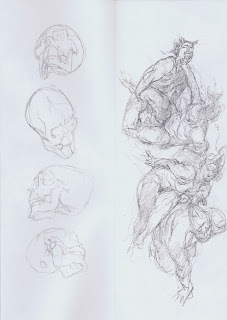 Entertainment was another big word. 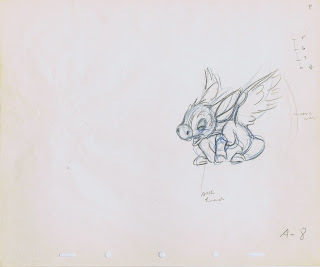 "We don't just move things around, we are here to entertain an audience" he said. 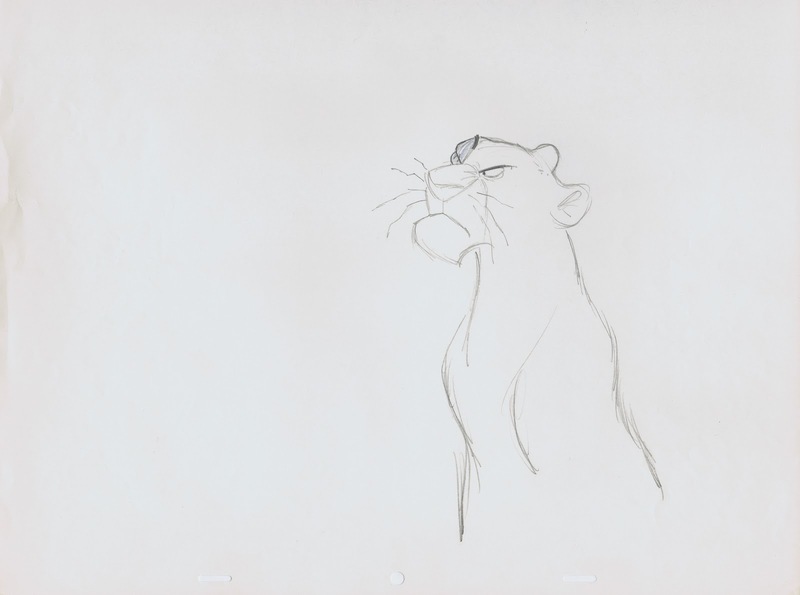 Eric talked a lot about Walt's philosophy and his high standards. 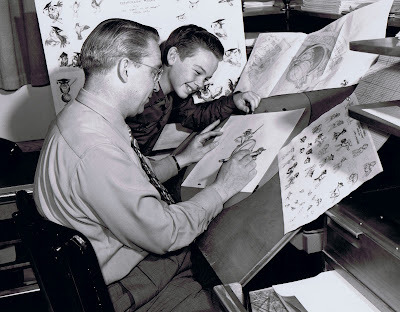 Walt would never talk down to an audience, he always raised people up to where he was. 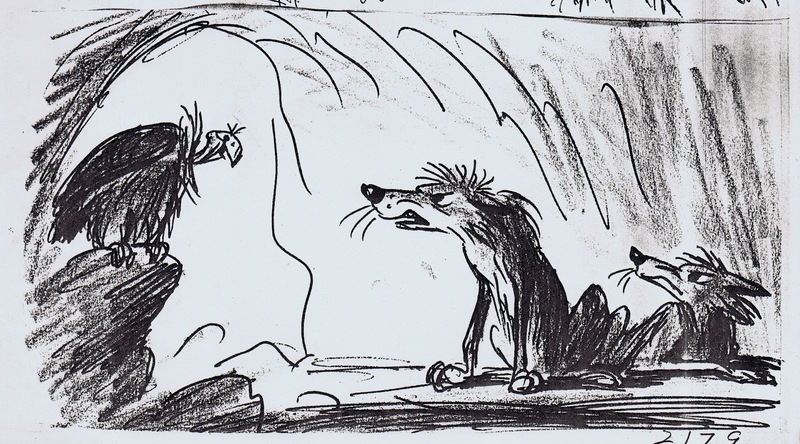 In other words, he always gave them more than what they expected. 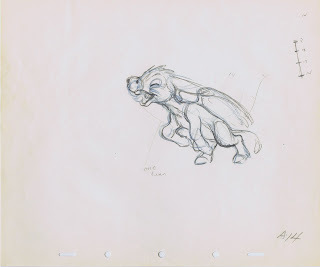 And it was very clear to him that being a Disney animator was the best job in the world. This is the last character Eric supervised before moving into teaching. 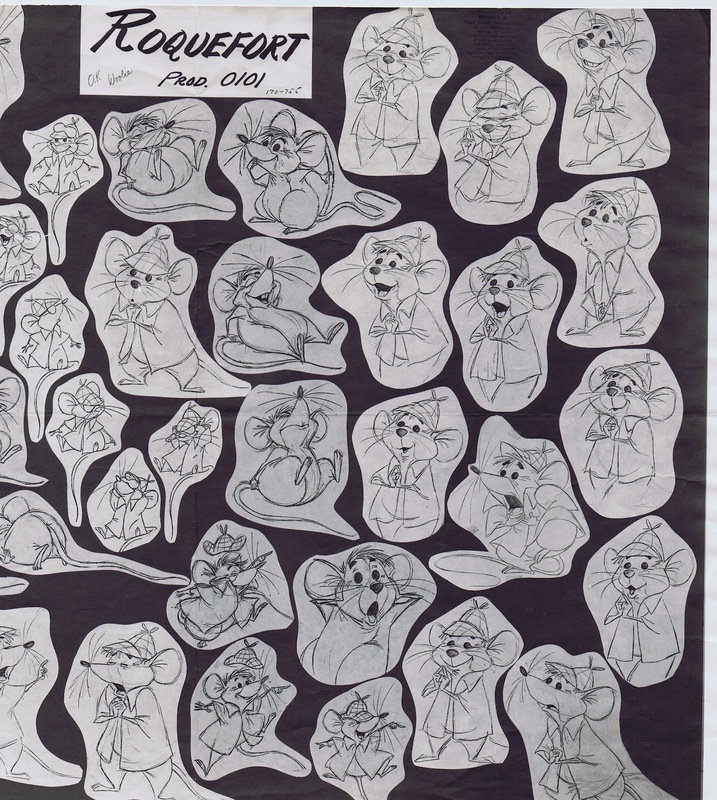 It is Roquefort from The Aristocats. 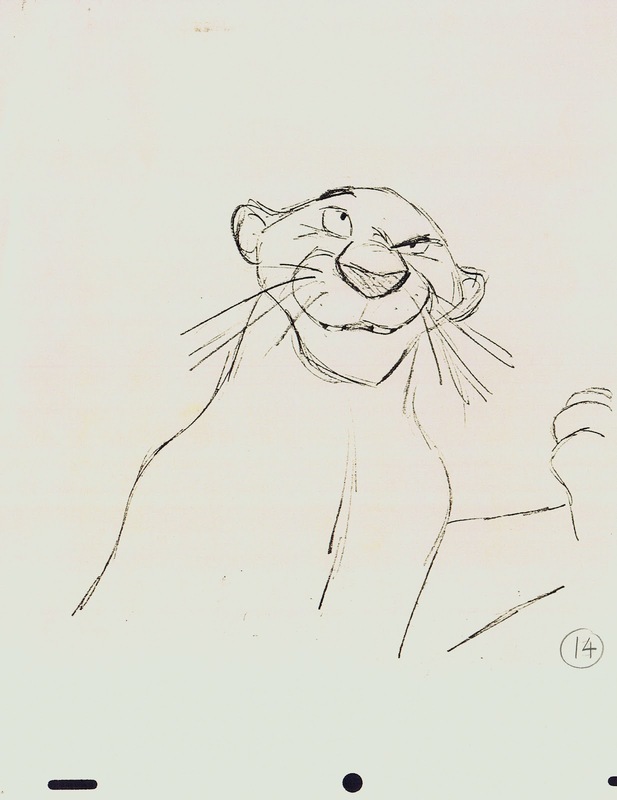 I always loved the quirky, real-mouse-timing in his acting and movements. 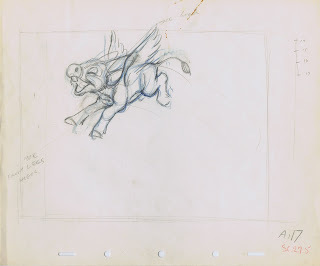 In February of 1945 Disney Studios released the feature "The Three Caballeros". 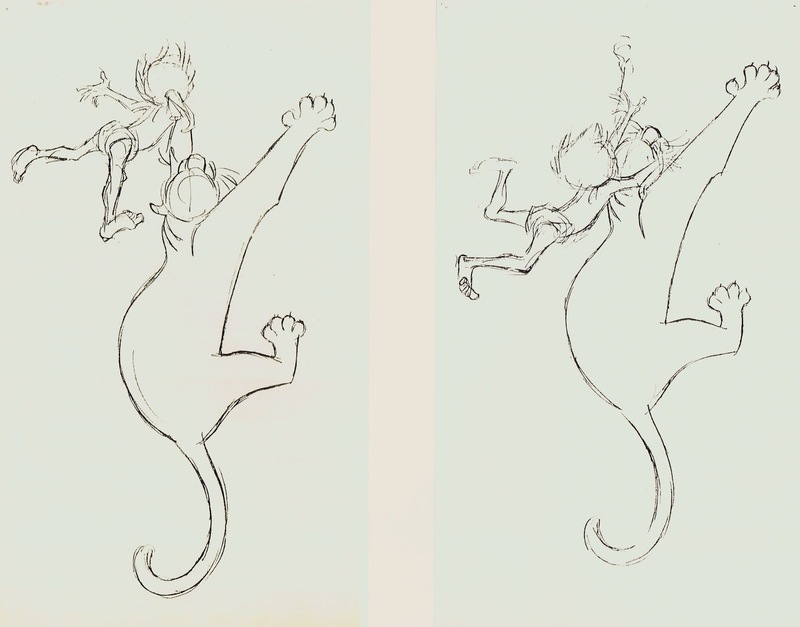 The most charming sequence in the film is probably The Flying Gauchito. 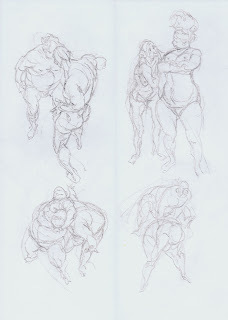 Frank Thomas did most of the animation of the two main characters, the Gauchito kid and the Burrito. But Eric Larson did significant scenes as well. 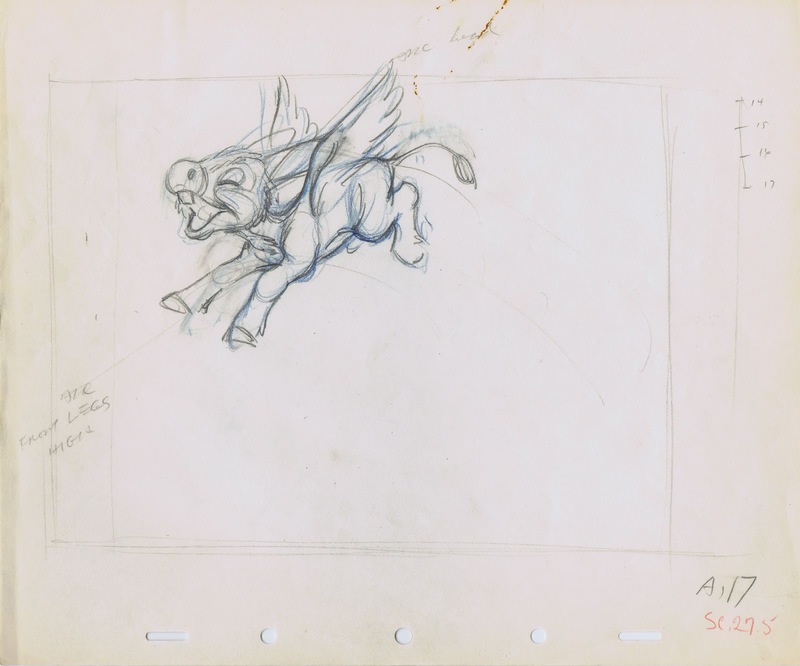 I can see why he was cast on the flying donkey, after all Eric had done a beautiful job with the flying horses in Fantasia. 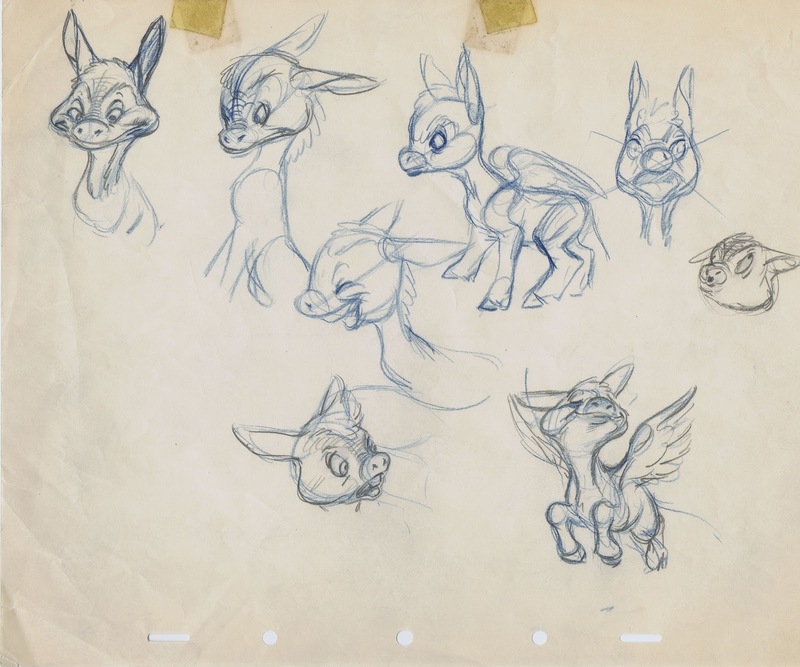 These are his design sketches and a few animation drawings showing the Burrito taking off. 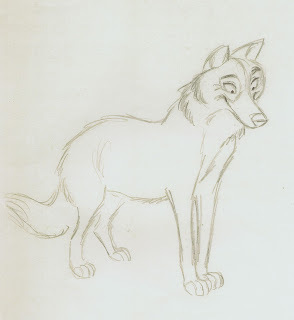 Eric admitted to some of us that drawing didn't come easy to him, he actually had planned to become a writer. 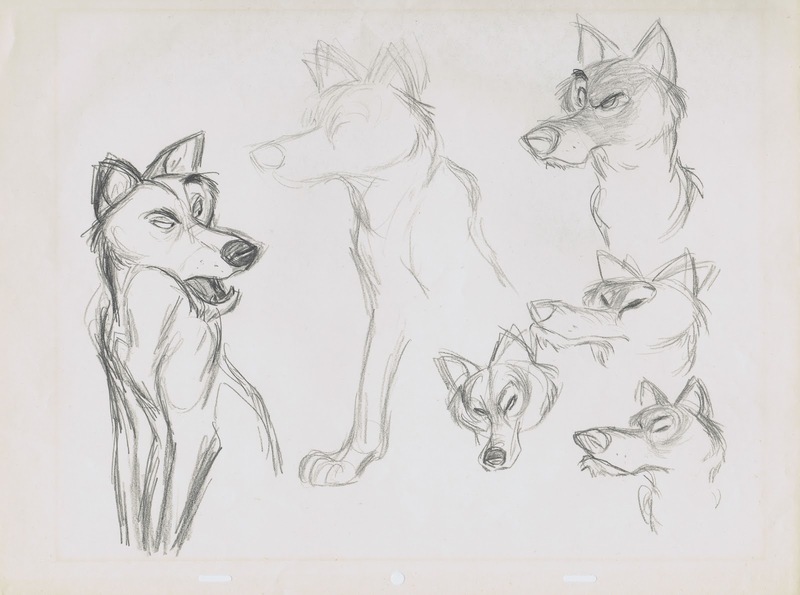 But when he fell in love with animation his career took a turn, and Eric worked for Disney as an animator (and later animation teacher) for the rest of his life. 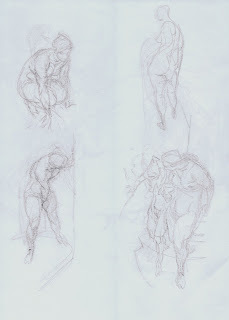 There is a lot of work in these drawings. 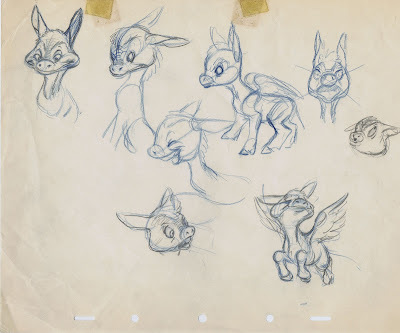 This is a fantasy creature, but the anatomy is based on a real donkey, and the wings move convincingly. 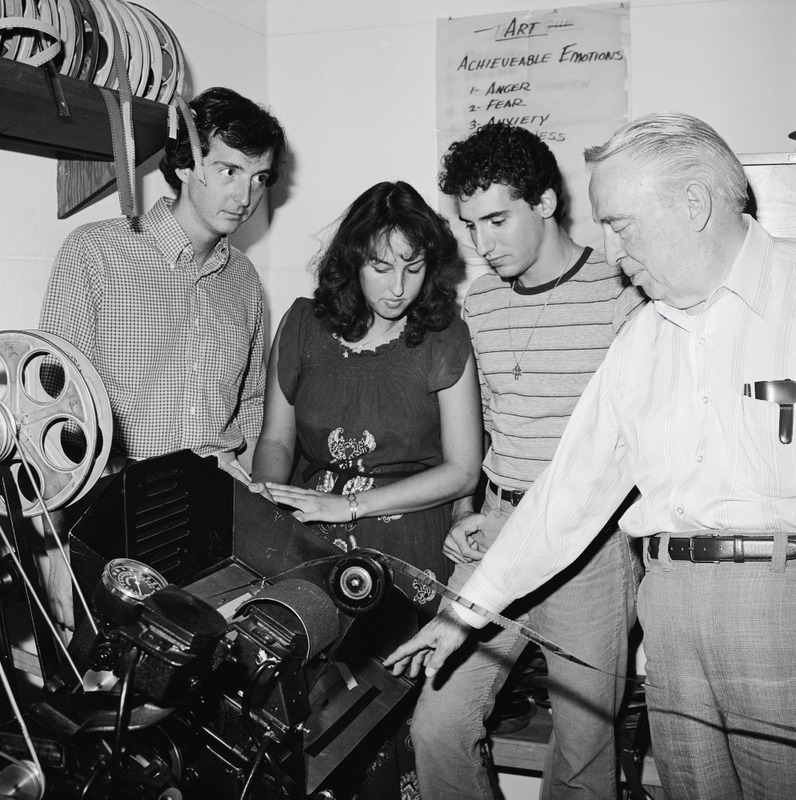 A few years later this photo was taken, showing Eric with actor Bobby Driscoll during production of "So Dear to my Heart". 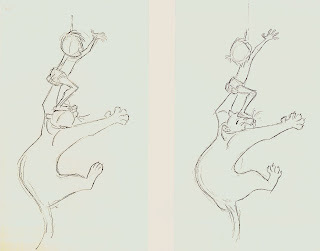 Eric animated scenes with the Wise Old Owl and the Lamb Danny. 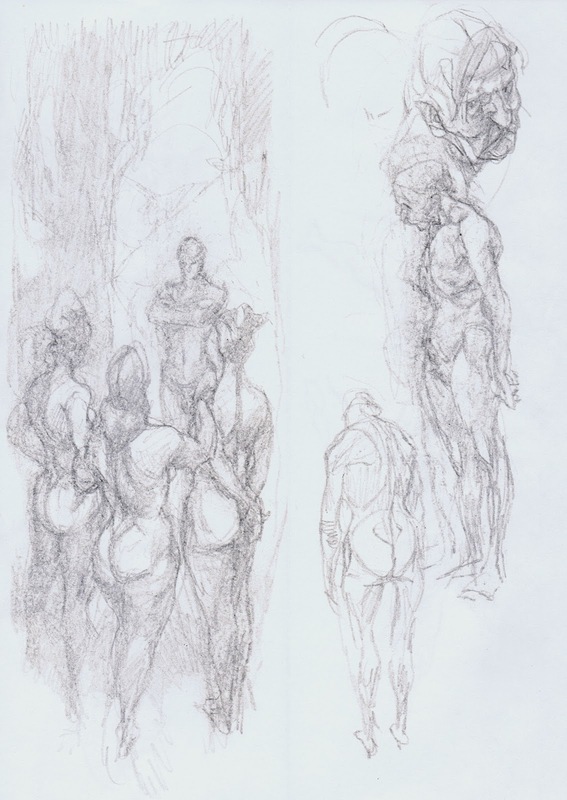 Even though Eric Larson's draughtsmanship might not have come up to the level of some of his colleagues, his sincere love for the medium shows in every one of his assignments. 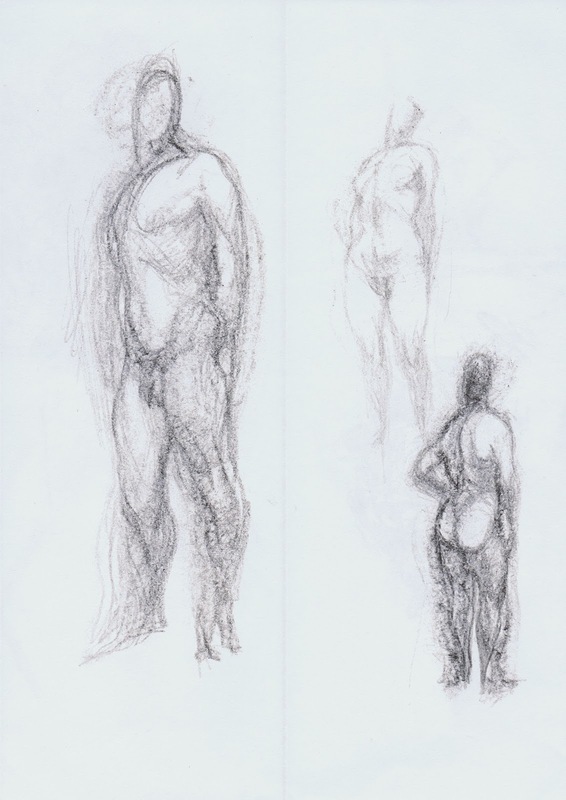 These marvelous life drawings and other doodles by Wilhelm M. Busch were published as a little sketchbook in Germany. 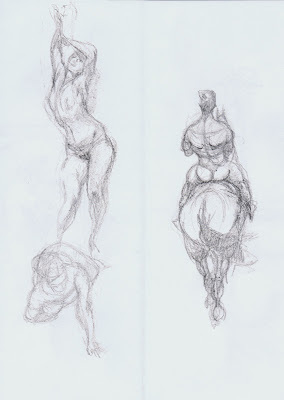 The occasional sexually provocative quality in them makes me want to name him the German Frazetta. Busch's sense for anatomy with beautiful rhythm and composition is masterful, that's for sure. 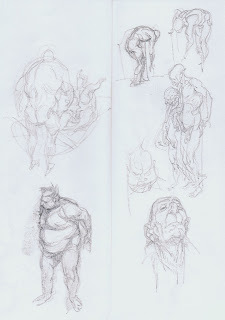 Every sketch is interesting, often the perspective is daring, and I don't see any drawing formulas here. 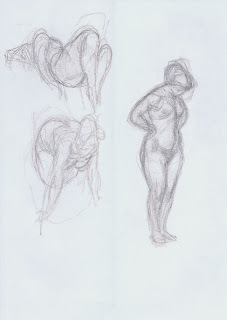 No flashy shading or over confident lines. His proportions always show contrast, thick upper legs with thin ankles, for example. I love the way he sees things. 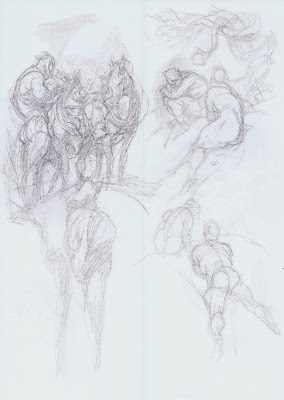 Everything is based on intense observation of human and animal figures. 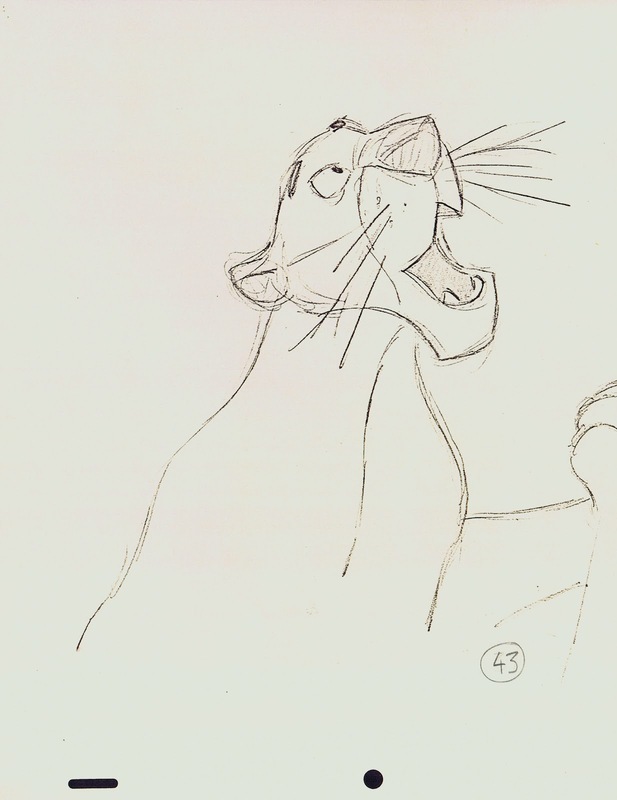 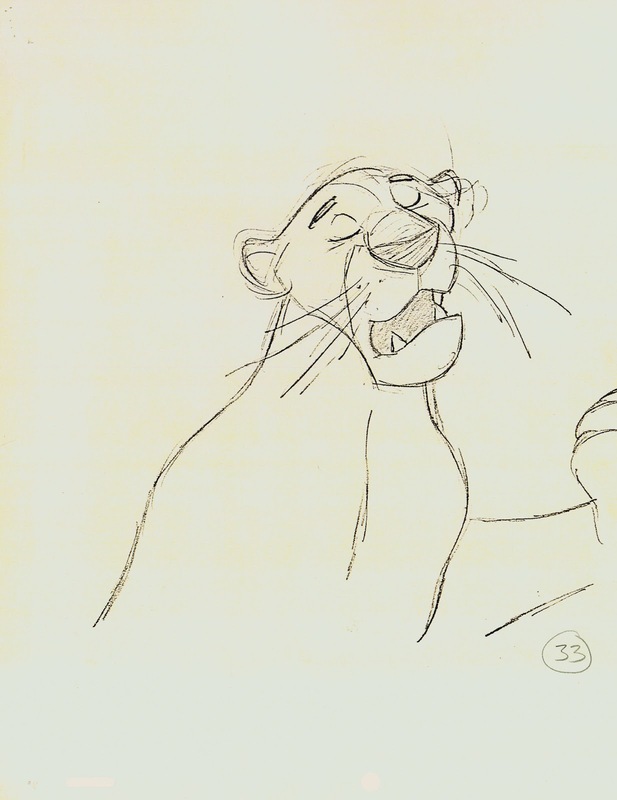 Milt Kahl animated this Bagheera scene early on during production. 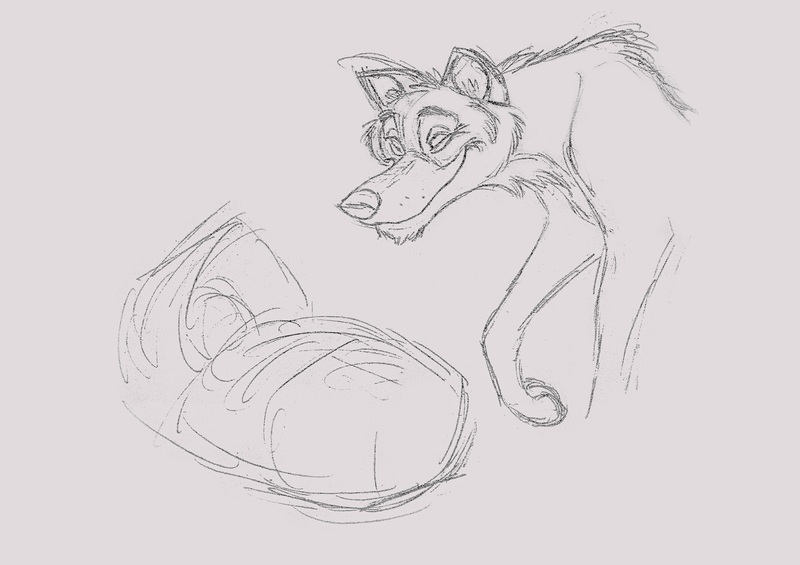 There is still some experimentation going on here with facial features. 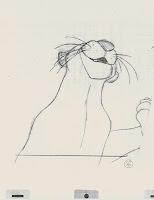 The jaw line going to the ear is something Milt simplified later. 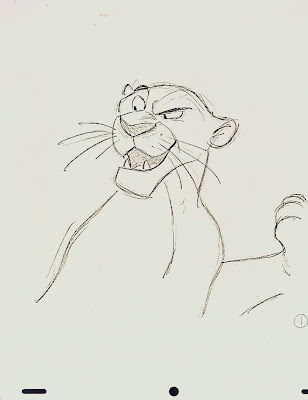 I find the asymmetrical shapes of the panther's muzzle, nose and eyes just beautiful. 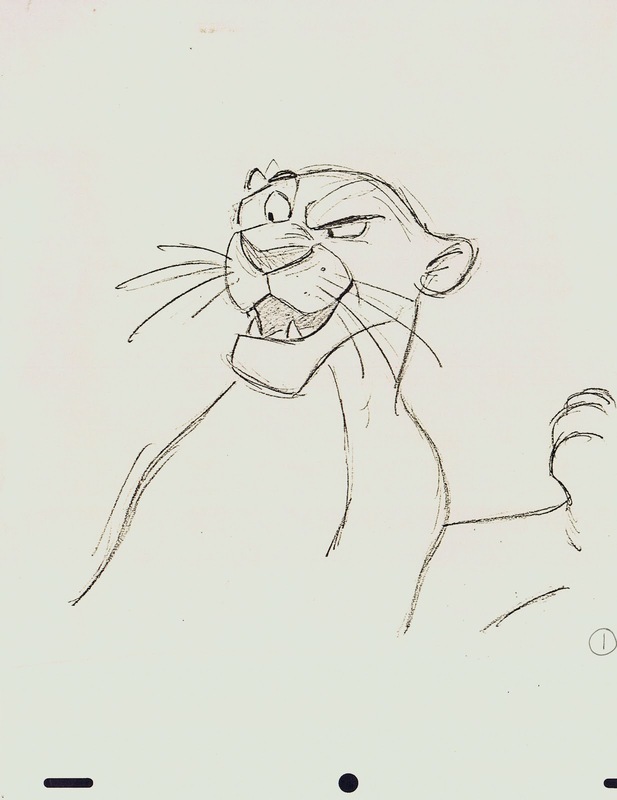 Every expression is inventive and has the essence of a big cat. 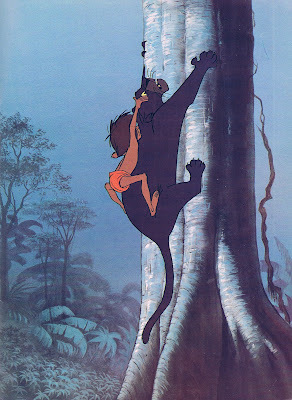 Incidentally, it is in THIS scene, when Bagheera asks Mowgl to get up the tree: "Go on, up you go! 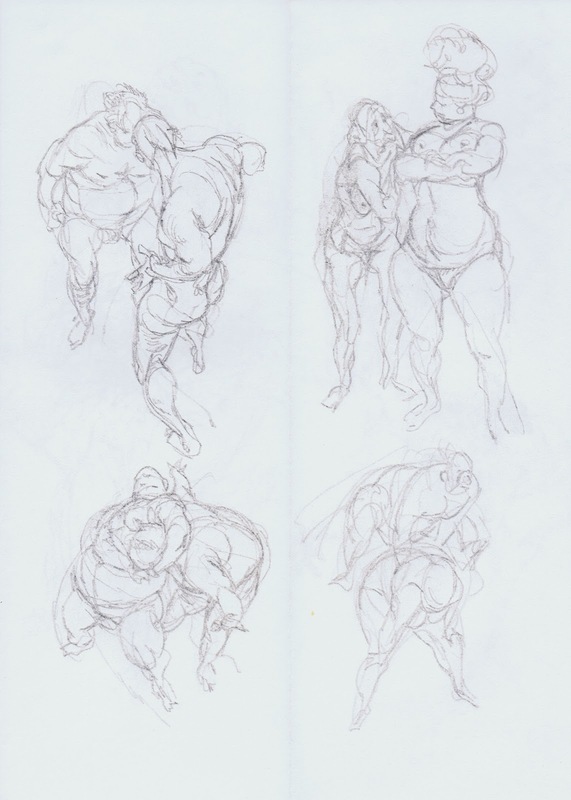 ", not in the previously posted long shot with both of them. 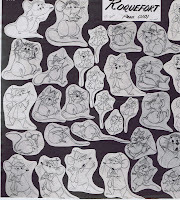 Years ago Milt's assistant Dave Michener let me xerox the copies of Milt's rough animation he had kept. And it is a real treat to see these drawings before an assistant cleaned them up. 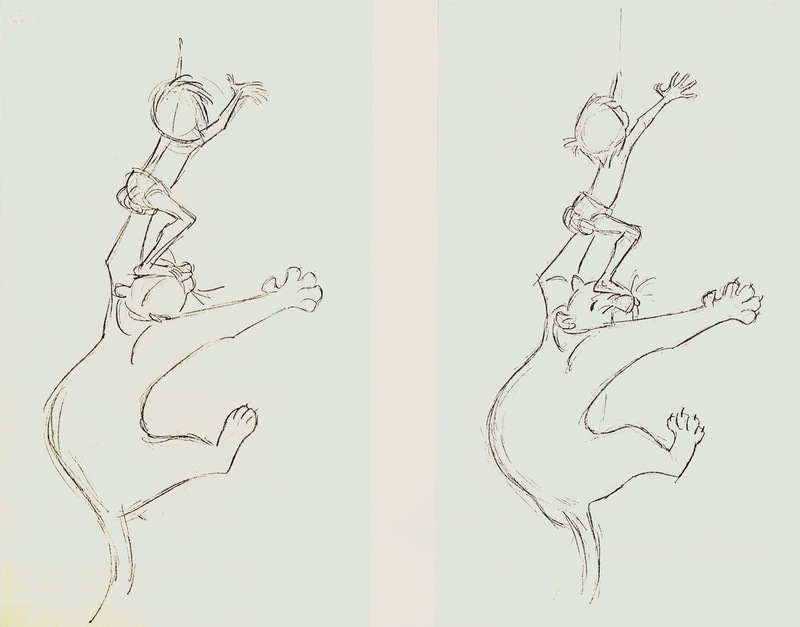 A few rough animation drawings from the tree climbing scene. 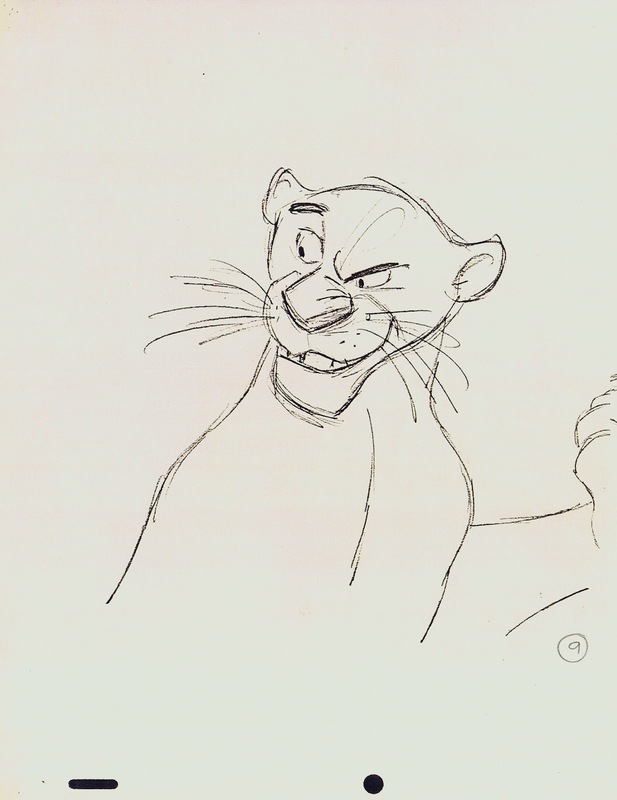 I don't think anybody else can draw and animate a panther with so few lines, and make the situation come off as believable and entertaining. Baloo in particular partied a little too hard with King Louie and the monkeys. 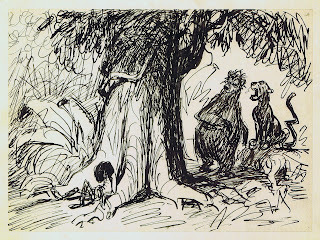 Ken Anderson came up with this beautiful sketch, which shows where Bagheera, Baloo and Mowgli are settling down after the rough encounter with the King of the Swingers. 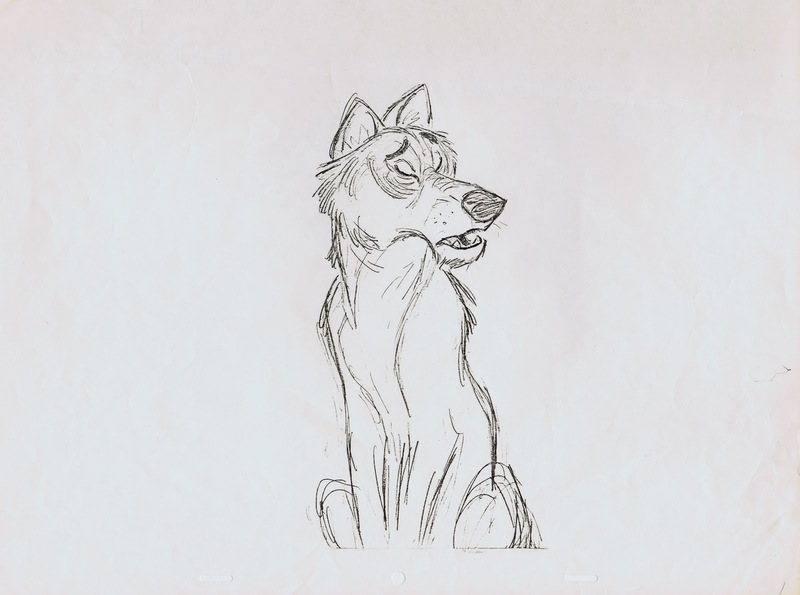 That sketch was the inspiration for the stunning production background. 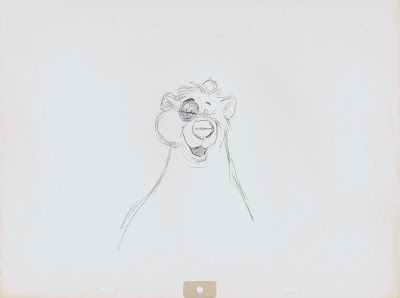 Ken also imagined what an "after party face" might look like on Baloo. 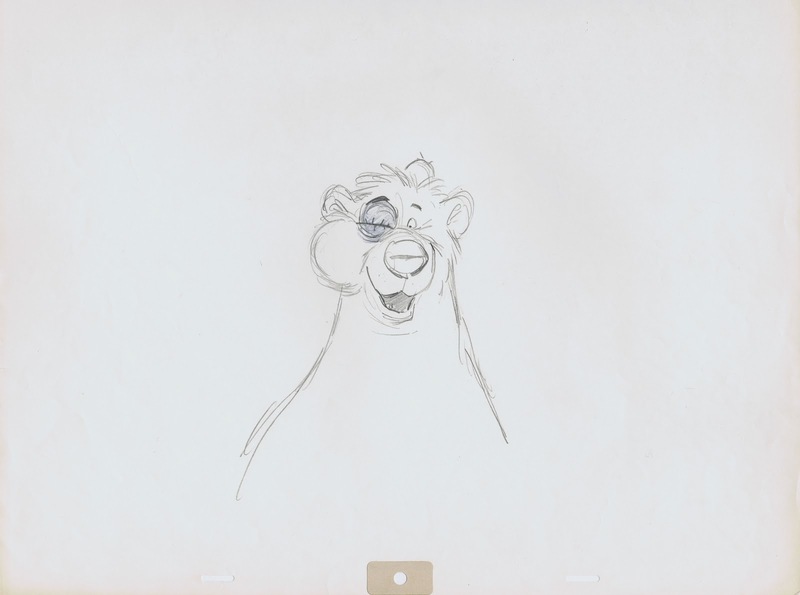 Milt Kahl then did his version based on Ken's, exaggerating the black eye and the swollen cheek. 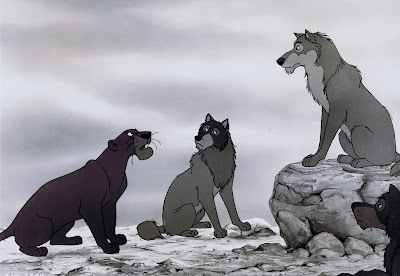 Bagheera is being told, he doesn't look like a basket of fruit either. 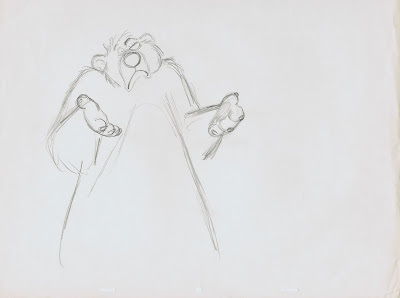 And here, one of my favorite Kahl drawings!! 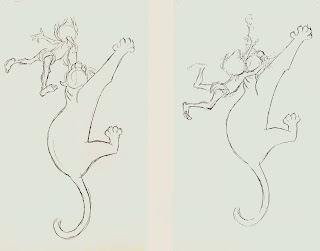 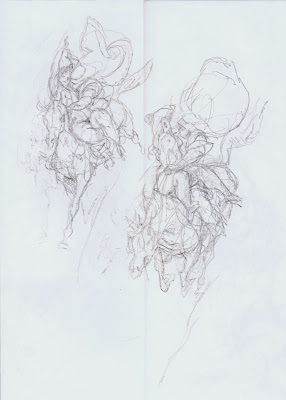 He did this one and the other sketches for Ollie Johnston, who ended up animating the whole sequence. 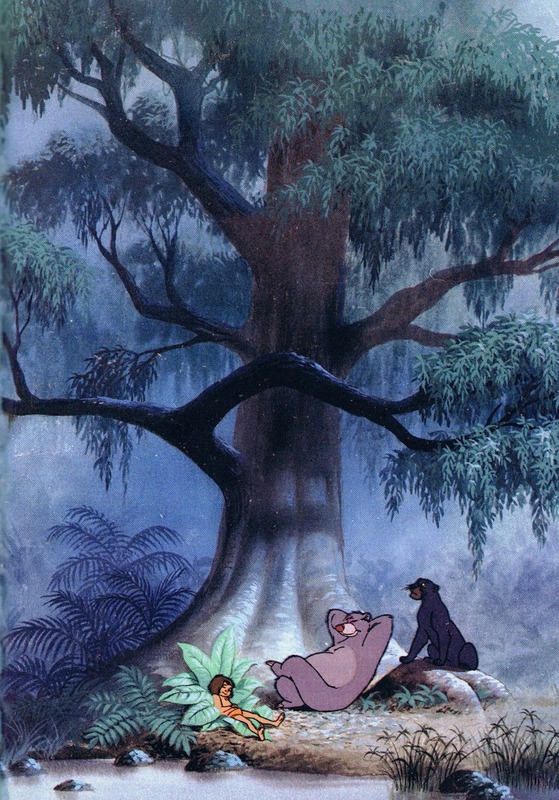 Bagheera is pointing out that Mowgli doesn't belong in the jungle, he is a human after all. 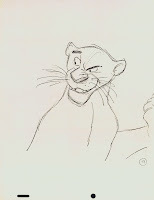 This is Baloo's response to Bagheera's line: "You wouldn't marry a panther, would you?" What a hilarious reaction !!! It is the essence of "I don't know!" 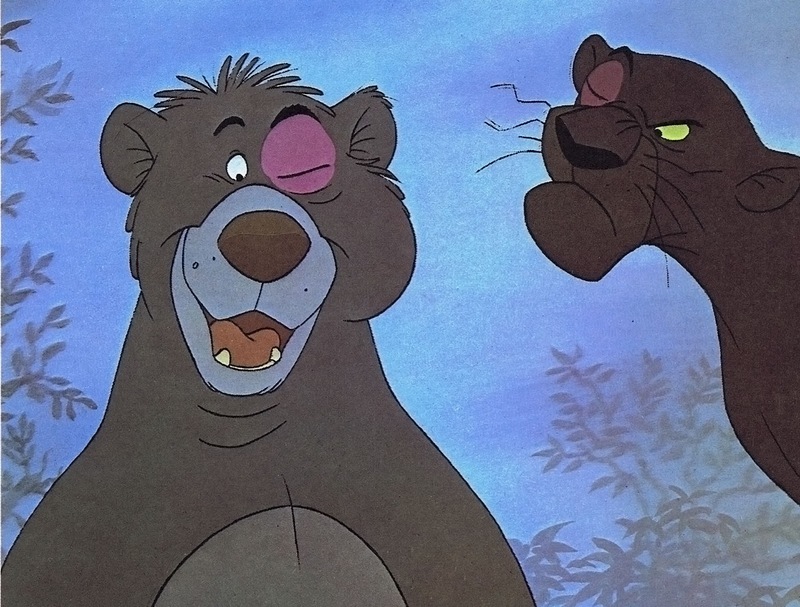 Baloo goes on: "No panther ever asked me." 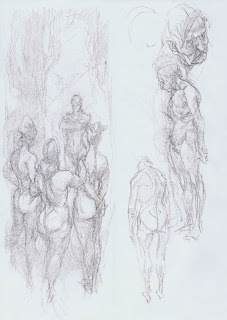 Amazing economy of lines. 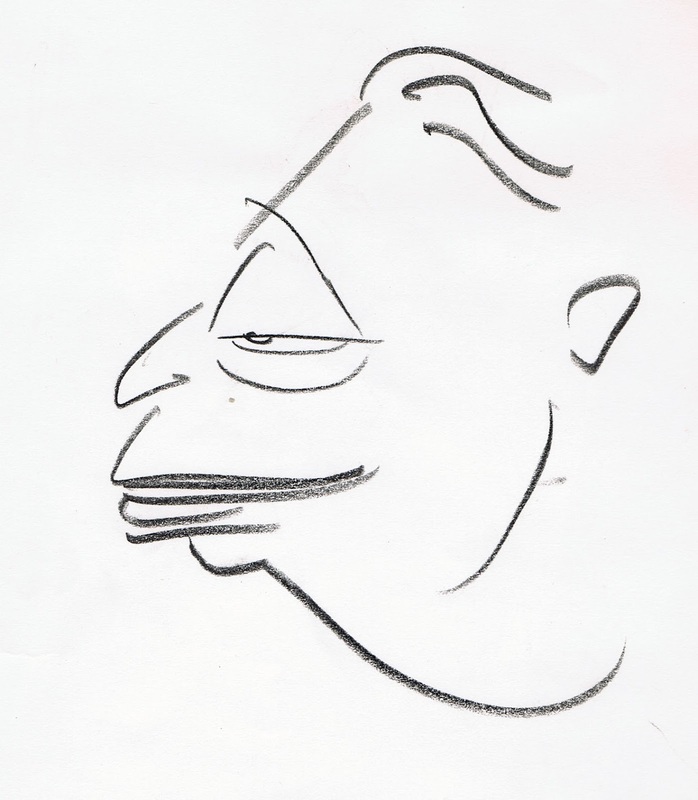 The drawing should hang in a museum. 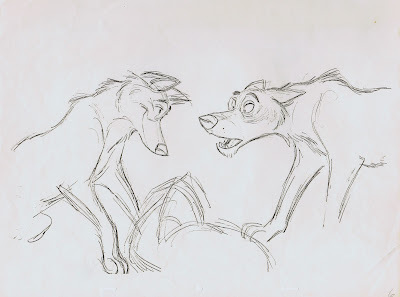 This is a great bit of character dialogue, and I find this sketch absolutely hysterical. 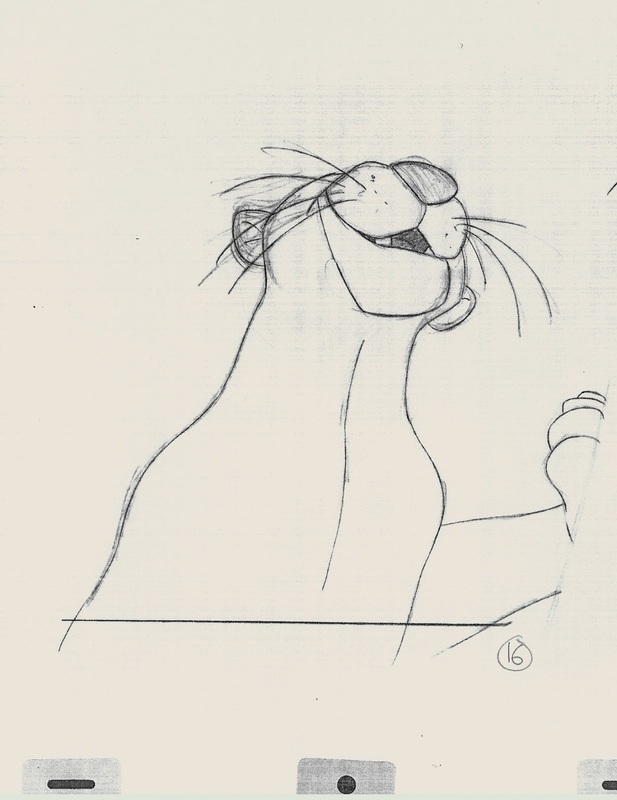 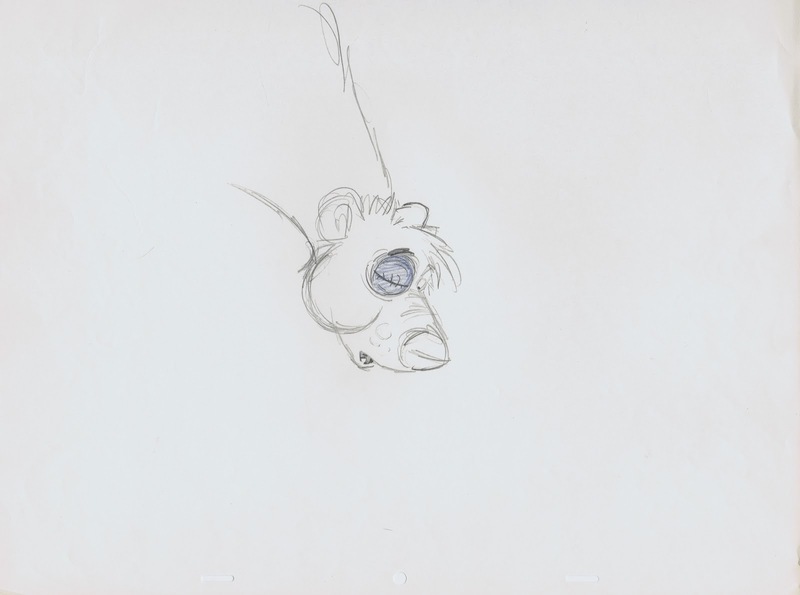 Milt's Baloo looks more stylized than Ollie's, nevertheless this pose made it intact into Ollie's final animation. 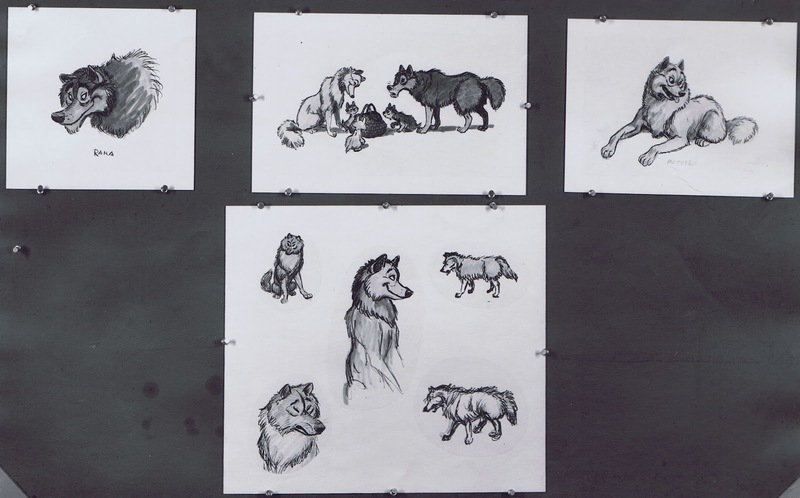 There were four artists who were involved in creating the wolves for The Jungle Book. 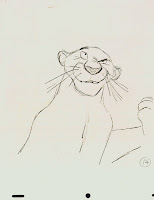 Story artist Bill Peet, who had boarded much of the film, before Walt Disney called for a much lighter tone for the whole project. 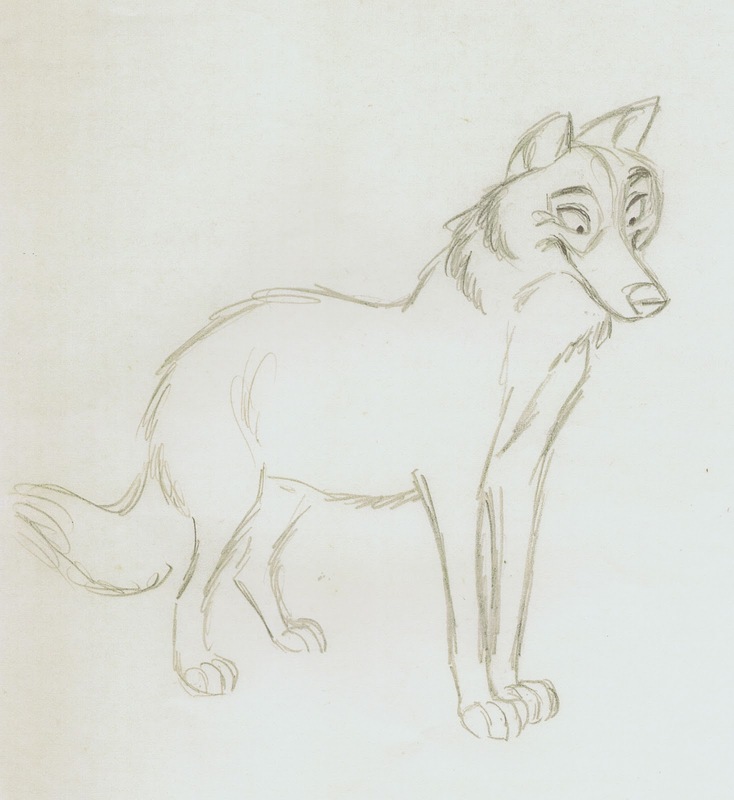 Peet's wolves looked somewhat like coyotes, and there might be a reason for that. I know he must have encountered coyotes quite often, living in the Hollywood Hills. And they are STILL around here. 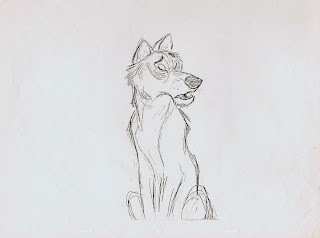 I live near his old neighborhood, and I see them regularly. 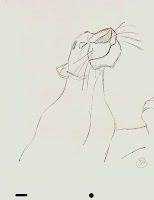 (They are fearless, and they want your pet for dinner). 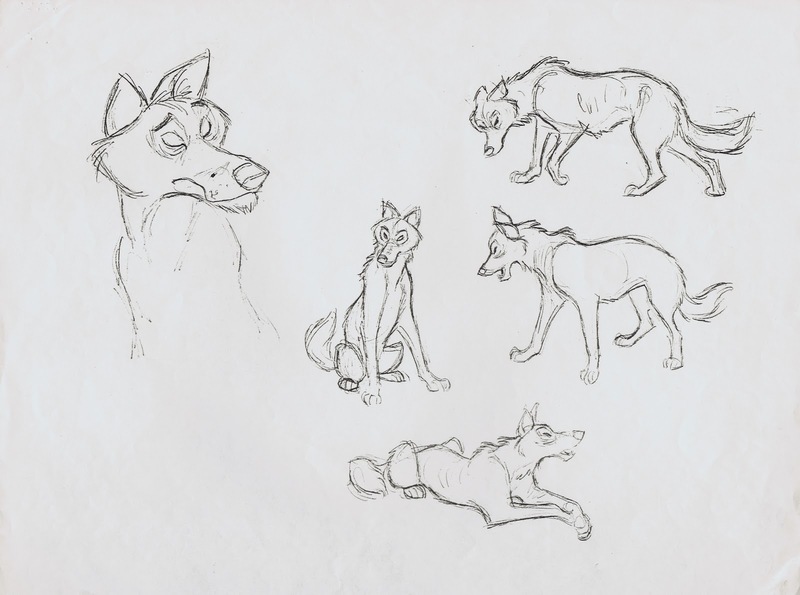 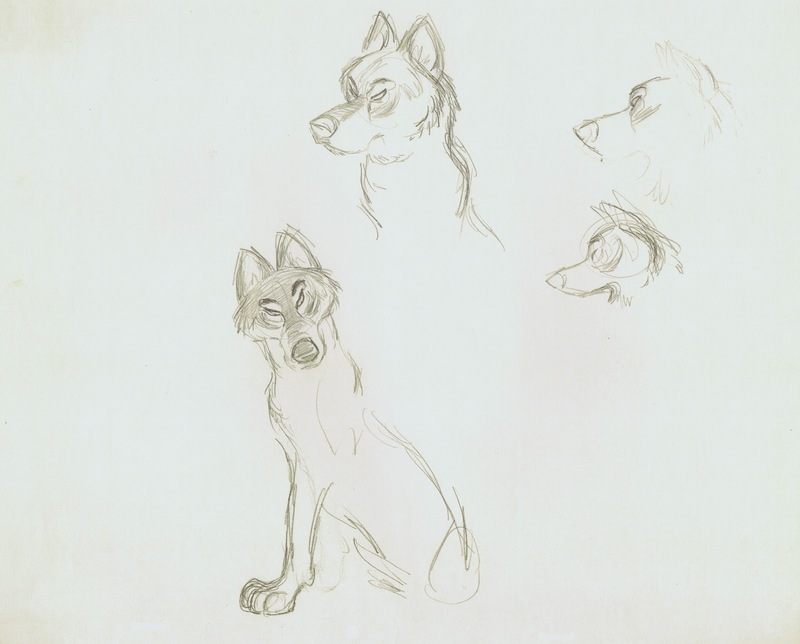 Ken Anderson's rough designs of the wolves show more fur, and distinctive personalities are starting to emerge. 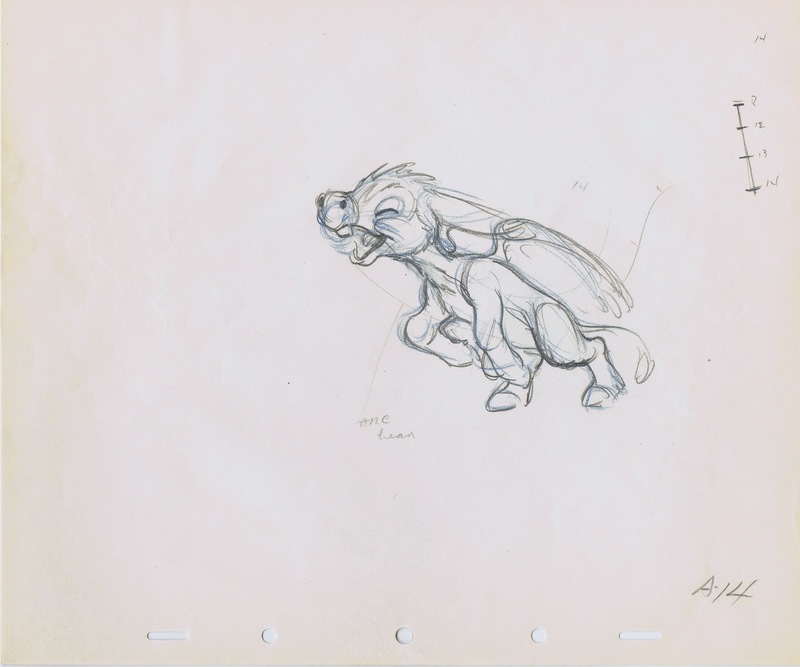 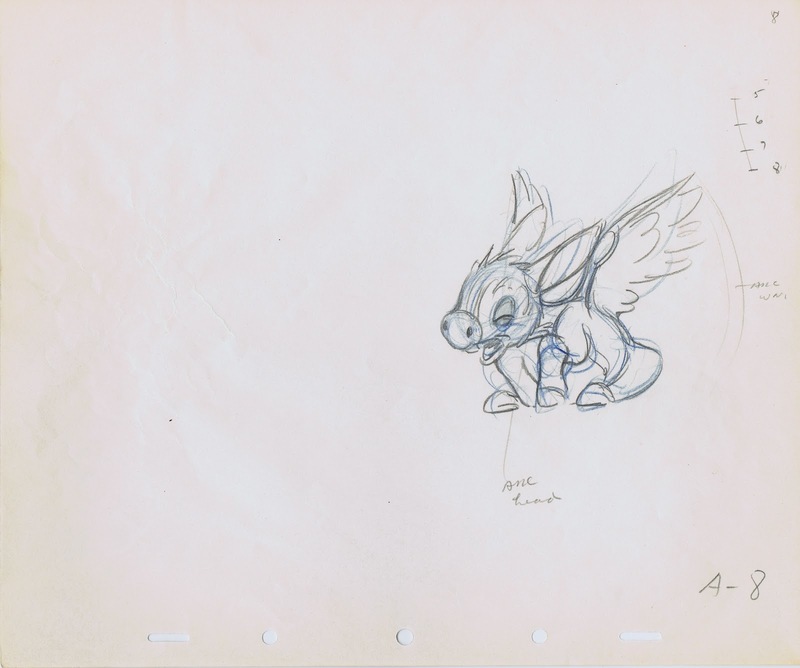 Milt Kahl looked at Peet's and Anderson's work, combined design elements and drew them with delicate realism. These drawings show research for Rama, the father, Akela, the leader of the pack and the wolf mother. 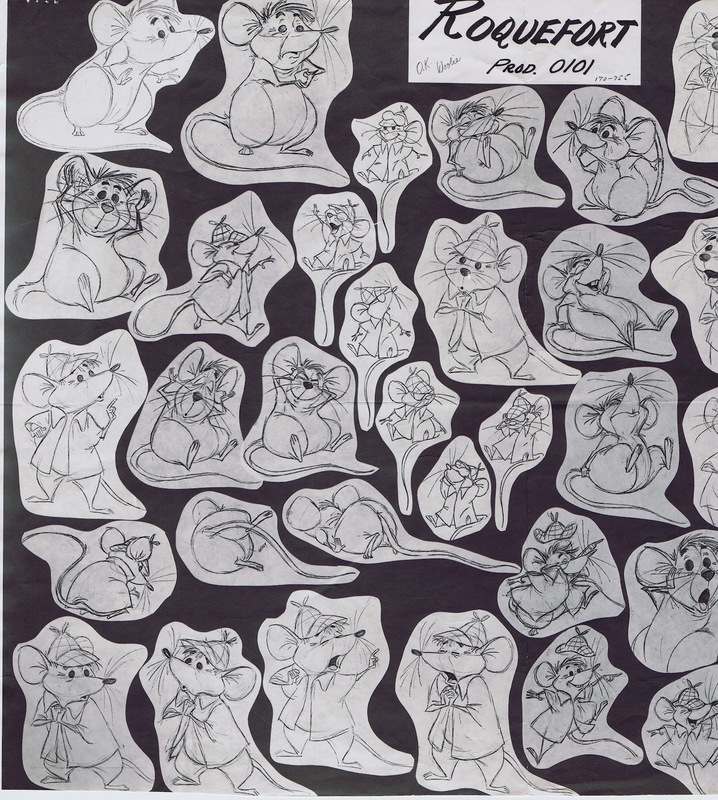 Hal King did the final animation of these characters.